North Korea's development of nuclear weapons raises fears of nuclear war on the peninsula and the specter of terrorists gaining access to weapons of mass destruction. It also represents a dangerous and disturbing breakdown in U.S. foreign policy. Failed Diplomacy: The Tragic Story of How North Korea Got the Bomb offers an insider's view of what went wrong and allowed this isolated nation—a charter member of the Axis of Evil—to develop nuclear weapons. Charles L. ''Jack'' Pritchard was intimately involved in developing America's North Korea policy under Presidents Clinton and Bush. Here, he offers an authoritative analysis of recent developments on the Korean peninsula and reveals how the Bush administration’s mistakes damaged the prospects of controlling nuclear proliferation. Although multilateral negotiations continue, Pritchard proclaims the Six-Party Talks as a failure. Pritchard's chronicle begins in earnest with suspicions over North Korea's uranium enrichment program in 2002, leading to the demise of the Clinton-era Agreed Framework. Subsequently, Pyongyang kicked out international monitors and restarted its nuclear weapons program. Pritchard provides a first-hand account of how the Six-Party Talks were initiated and offers a play-by-play account of each round of negotiations, detailing the national interests of the key players—China, Japan, Russia, both Koreas, and the United States. The author believes the failure to prevent Kim Jong Il from ''going nuclear'' points to the need for a permanent security forum in Northeast Asia that would serve as a formal mechanism for dialogue in the region. 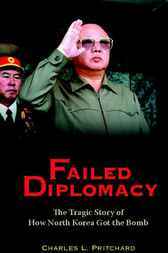 Hard-hitting and insightful, Failed Diplomacy offers a stinging critique of the Bush administration's manner and policy in dealing with North Korea. More hopefully, it suggests what can be learned from missed opportunities.